For many patients, there can be a tendency to ignore a missing tooth when it’s a molar in the back of your smile. Regardless of where you are missing a tooth, it’s important for the health and function of your smile to seek out a restorative option. While there are many options available for this issue, few are more beneficial to your oral health than dental implants. 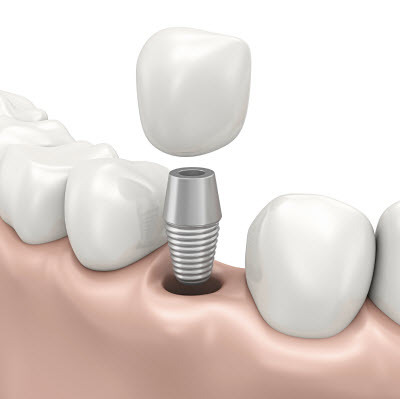 Our general dentists have experience performing dental implant placement for our Don Mills patients. If you have questions about this comprehensive method of restoring teeth, call our office today to set up an appointment. Dental implants are a restorative treatment option that is designed to supply strength and stability to your restoration. The procedure involves surgically positioning a titanium post into the jaw bone and beneath the gum line acting as a tooth root. This artificial root then goes through the process of osseointegration, where the post fuses to the jaw bone, creating a stable foundation for a specialized prosthetic. Traditional teeth replacement options rely on bulky metal clasps or messy adhesives to secure them in place. While they do effectively close that existing gap in your smile, patients can experience frustration because their dentures slip out of place or their bridge doesn’t provide the stability to their bite that they need. The clasps used to secure a dental bridge require the surrounding teeth be altered for the clasp to fit. Our doctor is able to mount your restoration directly to the dental implant with an abutment, which eliminates the need for clasps or adhesives. Having a stable bite allows for proper chewing, a necessary component of a healthy diet. Incorporating dental implants into the restoration process can introduce additional benefits beyond stability. Implant posts also increase the chances of renewed strength, improving the health of a patient’s jaw. When a tooth is removed, the jaw tissue no longer receives stimulation and pressure to the area, causing it to deteriorate and shrink. While traditional prosthetics prevent adjacent teeth from shifting, they don’t do anything to prevent the resorption process. By having implants placed, the former gaps are filled, limiting the movement of surrounding teeth and bolstering bone volume. For patients who are experiencing resorption, we can perform bone grafting or a sinus augmentation to create a stronger foundation for future dental implant placement. Contact Us in Don Mills Today! At Donway Dental, our doctors perform dental implant placement and provide quality restorations for our patients in Don Mills, North York, and York Mills. If you are looking for a general dental practice that can help you replace missing teeth in your smile, call us today to set up an appointment.